Apr. 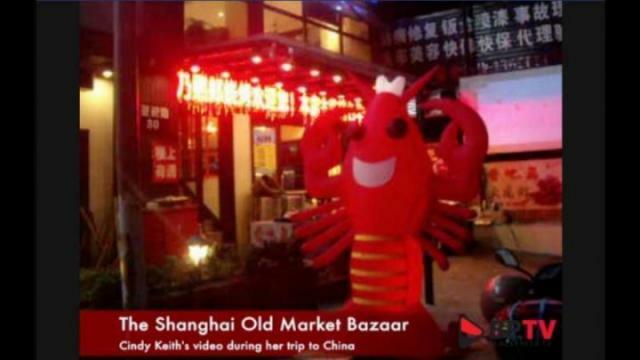 18, 2017 4:00 p.m.
Vernon’s Cindy Keith won a once-in-a-lifetime all-inclusive trip to China through Black Press Media and the Abbotsford Chamber ofCommerce and now – she’s sharing her experience with you. Blog #2: The sheer monstrosity of Shanghai! We boarded for our flight to Shanghai then traveled by bus one-and-a-half hours away; 100-km northwest to Suzhou. This city’s pretty canals, stone bridges, pagodas and meticulously-designed gardens have contributed to its status as one of the top tourist attractions in China. Its Classical Gardens were added to the UNESCO World Heritage sites! My most favourite and the one we investigated most extensively, was the centuries old Lingering Garden; a close second, the West (Monastery) Garden. We had a traditional noodle soup for dinner – a big hit. The next day we were busy touring the Suzhou silk factory – throughout China’s Imperial past, Suzhou silk has been associated with high-quality silk products, supplying silk to ancient royal families. By the 13th century, it was already the centre of the profitable silk trade. We learned even the likes of Vera Wang, Georgio Armani and many more designers have been, and continue to be, benefactors. Even the former Lady Diana Princess of Wales ordered silk for her wedding gown from Suzhou! Our local guide Lili told us Suzhou is known as the “Venice of the East” or “The Venice of China”. Shanghai is the most populous city proper in the world, with a population over 27 million! It’s a global financial centre and transport hub, with the world’s busiest container port. It sits on the south edge of the great Yangtze River and is bounded to the east by the South China Sea. I’ve heard of other nicknames such as “Pearl of the Orient” and “Paris of the East”. We did a tour of the Bund, the famous waterfront park that lines the shores of the city line. Of interest, China used to be called the “Kingdom of Bicycles” in the 1980s/90s because they were the popular mode of transport for Chinese people at the time. Thanks to the fast development of infrastructure over the years, cars, buses, mopeds and the metro reign superior today. However, a new bicycle wave is rising in China again thanks to the increasing popularity of mobile phone app-based bike-sharing services. The bike wave is not only creating an environment-friendly way of commuting in cities, but the China Daily highlights that the combined role of technology, innovation and market forces is better allocating resources and reducing pollution. Our last full day in Shanghai was spent initially visiting the Pudong economic development zone, seeing the fast speed of China’s developing economy. Next we visited a silk embroidery centre with beautifully handcrafted artwork and carpets with artists actually on site demonstrating how intricate their products truly are! We then arrived at the Old Shanghai Market (great shopping and be ready to haggle all the way!) for the afternoon. My third and final blog is now done. I’m just so appreciative of all the wonderful things I’ve been able to do – once again back in this vast Republic – thank you for sharing it with me! I’m super thrilled to have been selected to blog to newsreaders in British Columbia from afar and would definitely like to say “cheers” to my fellow travellers, the Black Press and the Abbotsford Chamber of Commerce for making it happen! Check out her first and second blog here. From Vernon to the Great Wall and Sensational Xi’an!